Home » Gaming » International TableTop Day 2017: Celebrating 5 Years of Gaming! International TableTop Day 2017: Celebrating 5 Years of Gaming! 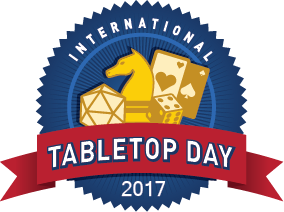 Written by: KristaG on April 27, 2017.
International TableTop Day 2017 will be held Saturday, April 29th! After the promo related debacle that occurred with Geek and Sundry‘s 4th International TableTop Day last year, the yearly celebration is almost upon us again. That’s right! This weekend, on Saturday, April 29th, International TableTop Day will be returning to many local game stores, libraries, schools, and even Barnes and Noble stores for it’s 5th consecutive year! As with last year’s TableTop Day, Geek and Sundry has made several changes to the event. 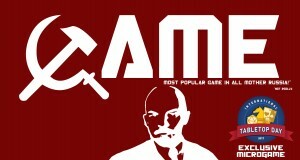 They have, in my opinion, done a much better job of streamlining their revamp. Like last year, the day is meant to focus more on the act of gaming instead of having tons of highly coveted promotional items. With this shift of focus, Geek and Sundry have decided to completely eliminate the retail boxes this year. Instead, they are offering a la carte purchases of Tabletop Day exclusive items available through several distributors along with their “core” TableTop kit. 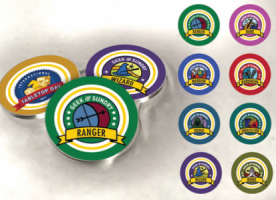 Inside the TableTop kit are items such as stickers, buttons, and custom silicone wristbands. These provide a nice mix of items to commemorate the event and, in my opinion, fit the shifts of focus. Included in the a la carte options are double-sided character class tokens from Broken Egg Games that can be used when playing some of your favorite RPGs; yet another International TableTop Day Castle Panic promo from Fireside Games; a promo pack from Indie Boards and Cards for Aeon’s End that includes a new minion (Glyph Enigma), 5 copies of a new spell (Drown in Flames), and a randomizer for said spell; a mini expansion for Smirk and Dagger‘s Biotix that introduces 2 new types of microbes and includes rules for new mechanics as well as incubator cards; new promo cards from Renegade Game Studios for both Fuse and Clank! ; a new promo card for Cryptozoic Entertainment’s Master of Orion: The Board Game; and 2 micro games! The first of these microgames is from Hunter’s Books and is called “GAME – Most Popular Game In All Mother Russia: Not Really.” GAME is actually a game that is used to enhance other games that you’re playing at the same time as it creates other house rules for other game titles. GAME is going to be exclusive to TableTop Day 2017 and only available in brick and mortar stores. 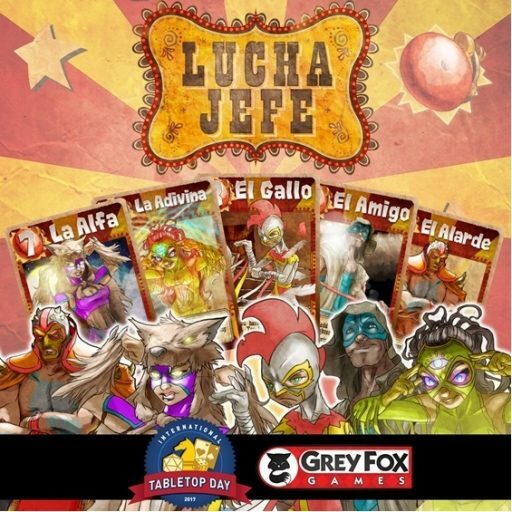 Luche Jefe is the exclusive microgame from Grey Fox Games. Coming from Grey Fox Games is the second microgame – Luche Jefe. In the game, players take on the role of luchador managers trying to recruit only the best fighters. The game only lasts until someone wins 3 rounds and earns the title of Luche Jefe. There are only 500 copies of this game being printed and they will include a limited edition TableTop Day 2017 screen printed bag as well as a promotional character. Here in Sacramento, there are several locations that will be hosting International TableTop Day events including Great Escape Games. I, personally, will most likely be running a few demos much as I did last year with my friends down at Great Escape Games. If you’re in the area, I’d love to see you there! Sticking with this year’s focus set by Geek and Sundry, I’d love to hear all about “how board games have changed your life.” Did you meet your partner playing a game? (I did!) Perhaps being a Dungeon Master with your group inspired you to become a writer? I’m sure there are tons of stories to be shared and I’d love to hear from you! In addition, I’m curious as to which of this year’s items are you looking forward to the most? Personally, I’m interested in Luche Jefe as it seems like a game I could have a lot of fun with, but I’d also be happy with the simple addition of another promo for Castle Panic. All of that being said, I hope you have a great time at whatever International TableTop Day event you find yourself at!